Firstly, I want to apologise for the quality of these pictures. My camera is a basic one, I'm not a photographer, and I really just wanted to focus on enjoying the experience! Anyone who knows me well, will know that Hayling Island is my happy place. My dad lived there for a while and fell in love with the island, so naturally we spent a lot of time there when I was a child. My parents now own a caravan there, and it's my absolute favourite place for a weekend away. We took Archie there a few times last summer... look how cute he was during one of his first trips! Like most places it's not always dog friendly (there aren't all that many restaurants which allow you to take dogs in, etc) but the beach is fabulous, and it's a lovely place to walk. 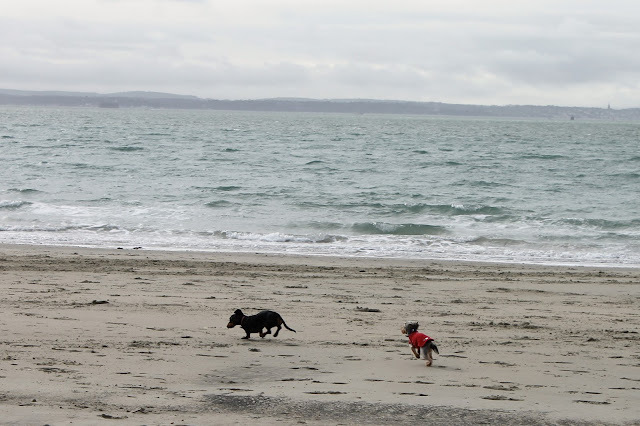 Having said that, until yesterday my two crazies had never actually had a free run on the beach. When we last visited with Archie it was peak season, when dogs aren't allowed on the main beach, and as far as I'm aware Winnie had never been to the seaside at all! When I got Winnie, I relied heavily on dachshund-focused facebook groups. No amount of research in the world can fully prepare you to take on a rescue dog with some issues, and it was (and still is!) great to have thousands of people you can call on for advice. I joined a few local daxie groups and was pleasantly surprised to find that many of them go on regular group walks; when I saw one arranged for Hayling Island, I knew I had to go. It was perfect that Archie and Winnie would experience their first seaside freedom in my favourite place on earth! We met at the Ferry Boat Inn (a lovely place to eat, and to sit on the terrace in the sun with your dog) and walked across the sandy beach at low tide. In all the years I've visited Hayling, I've never walked on this far side of the beach! Now I know how lovely it is, I think I'll return again and again. Now, my two can be little hooligans... so I was wary to let them off lead. They tend to behave totally different on group walks though, so I bit the bullet and took advantage of having the beach mostly to ourselves. They absolutely LOVED it. 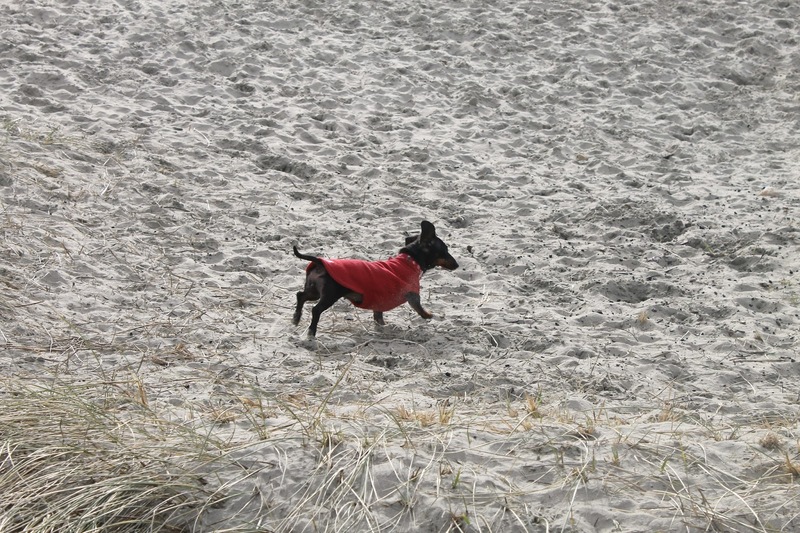 Archie made best buds with another daxie, Dexter, and sprinted up and down the beach gleefully. Winnie just loved being free; she likes to trot along with the pack but mainly she does her own thing, being slightly older and slower than the rest. She repeatedly ran along, ears flying, before stopping to look out to sea. I honestly could have cried at how happy she looked... when you rescue a dog from a poor life, every new experience is that bit sweeter. Archie will always have the most wonderful life I can give him, but Winnie had never even been a proper pet before she came to us. It makes me so happy to see her enjoying life. We had a lovely time, and as I said, I'll definitely be taking the dogs back to this spot. In fact, I'm hoping to take them back again this week if my parents are up for taking their dogs too! We finished up our walk with a cuppa at the little café hut nearby, and the doggies slept like logs the whole drive home! Do you regularly take your dogs to the beach? It's something I'm hoping to do much more often this year. 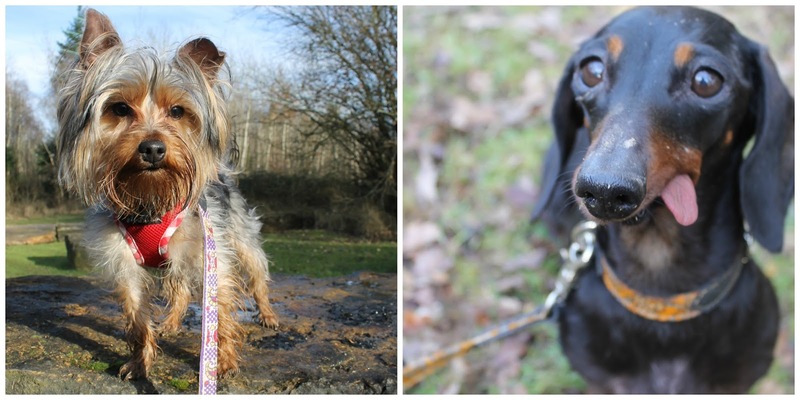 The dogs are wearing fleeces by Dryhound, and nautical collars from Fur N' Fabric! 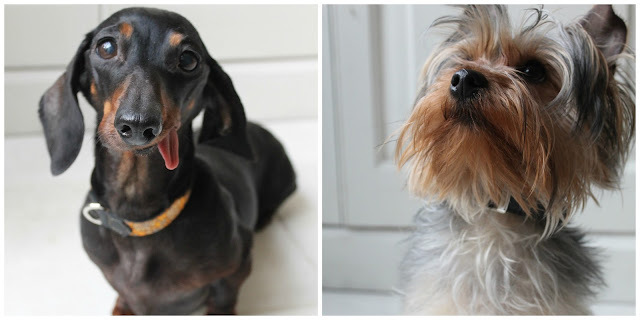 Hello, and happy #woofwoofwednesday to you all! I'm excited to share a little review with you this evening. Recently we were contacted by Koko Collective, an ethical pet accessory brand, who asked if we'd like to try out some of their collars and leads. Anyone who knows me in person will know that I absolutely love to support ethical operations, as well as small businesses in general, so of course I jumped at the chance. First of all... look at that gorgeous packaging! I absolutely love it when brands use cute finishing touches, and pay attention to the little details. I think things like this really encourage people to revisit a company time and time again; it makes the whole process so enjoyable to know that even the packaging of a purchase is going to be pretty! "Koko collective is an ethical accessories brand for people and pets. We sell unique handmade dog collars, dog leashes, cat collars and scarves crafted out of recycled bicycle inner tubes and vintage saris... Koko Collective was founded by Clara Jackson and Harriet Riddell in 2016, they are artists, designers and long-time friends travelling to Kolkata, India to help develop designs with a charity called Calcutta Rescue. The charity has been running in the city for 34 years it has clinics and schools providing free healthcare, food and education for the poorest families in Kolkata. Alongside the schools and clinics Calcutta Rescue set up a vocational training centre for ex-patients and students that would otherwise find it difficult to get employment. We have been working closely with the team to create our ethical pet and people accessories which we hope will help the charity provide more jobs and a better quality of life for the Calcutta Rescue team." As I said before, supporting ethical businesses is really important to me. I love the idea of having a collar made of recycled items, and it's wonderful that the people making these accessories receive a fair wage, free healthcare and schooling too! As the text above describes, the collars and leads are made from recycled bicycle inner tube and vintage sari fabric. The craftmanship is absolutely beautiful; the patterns are just stunning and I spent a long time drooling over all the difference choices! I liked the look of the inner tube much more than expected, and with time and wear the collars have really softened... it's a little bit like the way leather improves with age. My only wish for them is that they used more of the sari fabric on the collars, however the leads totally make up for this! 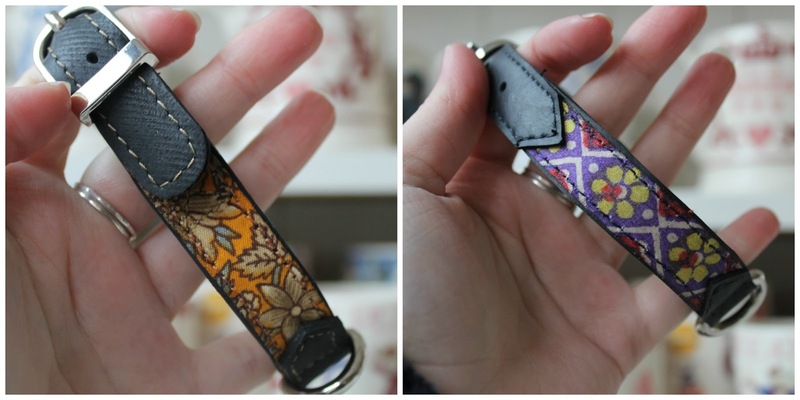 They're comfortable to hold, and really showcase the absolutely beautiful vintage fabrics used. Of course, we had to test the new sets out in our favourite place... the woods! 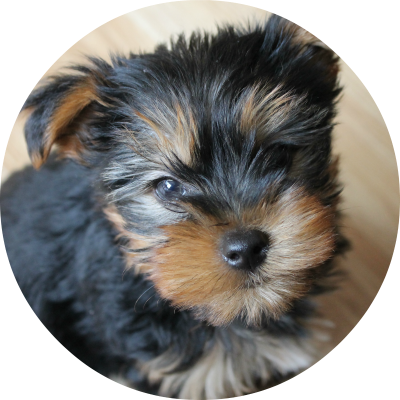 Koko Collective is definitely a company I would continually purchase from; what better than being able to spoil your pets at an ethical business, totally guilt-free?! Do you like the look of these collar and lead sets? Let me know in the comments!